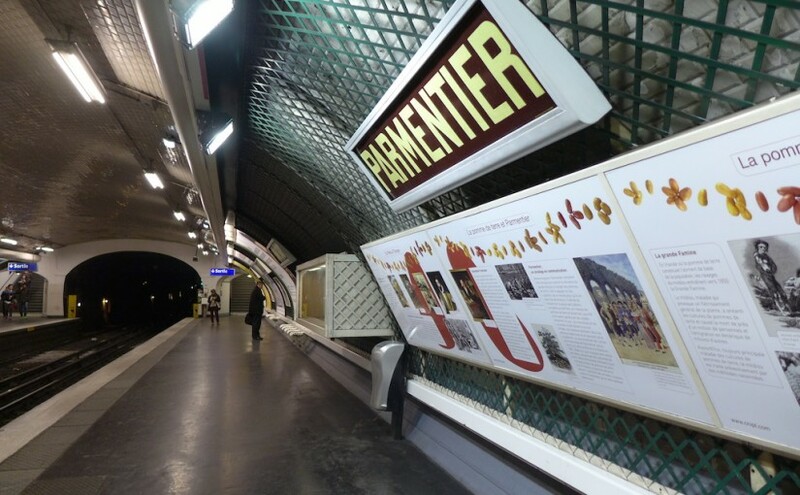 The metro station Parmentier reopened yesterday after two months of renovation. Let’s discover this gem of the Parisian underground life: it is on metro line 3, in 11th arrondissement of Paris. The station gets its name from the Avenue Parmentier, so called in 1818 in memory of Antoine Parmentier who died nearby five years earlier. Antoine Parmentier (1737-1813) was a French army pharmacist who is famous for being the one who promoted the nutritional values of potato and introduced its cultivation in France whereas it used to be forbidden due to its supposed toxicity. Anecdotally Parmentier discovered crushed potatoes in Germany where he had been taken prisoner. The decor of the platforms celebrates potato in all its forms. The screened camber reminds the mesh of the potatoes’ net. Some objects from pre-Colombian America are displayed in glass cases and billboards tell the story of potato from America to Europe and the main uses in France for each variety of potatoes. And do you know which is THE country for potato? It is Peru, where more than 4,000 different varieties of potatoes can be found!! Back to earth: One can admire the metro way out with its typical Art Nouveau kiosk made by Hector Guimard. And if you have become a fan of Parmentier keep walking east in the Avenue de la République: you will arrive to the Père Lachaise Cemetery and will be able to put flowers on his grave!